(CNS): A local service club has reaped on of the top honours at an international conference after being named Club of the Year a convention in Trinidad last month. The Lions Club of Tropical Gardens (LCTG) recognized for its contributions to the Cayman Islands community and its organizational skills, efficiency and quality of projects at the 32nd MD 60 Convention. Lion Lloyd Barker, MJF, District Governor of MD 60B told the Lions present at the convention that LCTG had accomplished all of his major goals for the lionistic year 2011-2012 and that the club had made him especially proud by sponsoring an Alpha Leo Club at the Clifton Hunter High school in Grand Cayman. The club was also the recipient of several district and international awards. 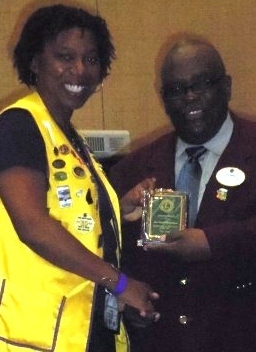 President, Lion Belinda Blessitt Vincent received the President of the Zone, Zone 4B award, secretary, Lion Norma McField, PMJF, was also awarded the Secretary of the Zone, Zone 4B. The club also received an award for its Health and Wellness projects. Lion Melrose Gooding, MJF Zone Chairperson 4B District 60B and past president of LCTG received the International President Certificate of Appreciation Award in recognition of distinguished achievements in fulfilling the mission of Lions Club International. Lion Elva Smith (President elect) was also appointed as a District Officer and will be part of the part of the Lions Club International Foundation (LCIF) team for the lionistic year, 2012-2013. The convention provided opportunities for Lions to develop personal skills and to share lionistic experiences and was attended by Lions across the Caribbean region, the club said. The Lions Clubs of Tropical Gardens in the Cayman Islands is a member of Multiple District 60 which includes the Lions Clubs in Anguilla, Antigua and Barbuda, Barbados, British Virgin Islands, Cayman Islands, Dominica, Grenada, Guyana, Jamaica, Montserrat, Netherlands Antilles, St. Kitts and Nevis, St. Lucia, St. Maarten, St. Vincent and the Grenadines, Suriname, Trinidad and Tobago and US Virgin Islands. Lion President Belinda said the awards were a culmination to a year of hard work by her club and thanked members and friends of lions who helped to make the year a success and made “Passionate Members Working Together to Build a Better Community", the club theme a reality.